Bali, it conjures up images of dramatic greenery, rolling rice fields and volcanic vistas. One of Indonesia’s most popular islands, it’s no wonder so many of us in the West choose this landscape as our ultimate holiday destination. It’s not just luxury sun seekers though, Bali is just as popular with global backpackers and honeymooners. But what about the food? When in Bali, it’s easy to be swept up into the endless track of tourist offerings. To get a real feel for the food of the locals, you need to do your research, and get off the beaten track to find the best of Bali’s eats. Balinese cuisine is driven by its local indigenous traditions as well as influences from the rest of Indonesia, China and India. Predominantly a Hindu island, culinary traditions revolve around religious celebrations and festivals where many special foods are prepared. One thing you can be sure to find on every menu or stall you pass in Bali, is rice, the staple of all dishes here. But that’s only the beginning. The day for a traditional Balinese woman revolves around food. Mumma Bali travels daily to her local markets to ensure she gets the freshest and best quality ingredients she can find. (Mumma Bali can’t afford to buy in bulk and she almost certainly does not have the luxuries of refrigeration to store leftovers). At 5am she enters the markets to acquire her produce. Generally, the meat will consist of ‘ikan’ (fish), ‘ayam’ (chicken) or ‘babi’ (pork). 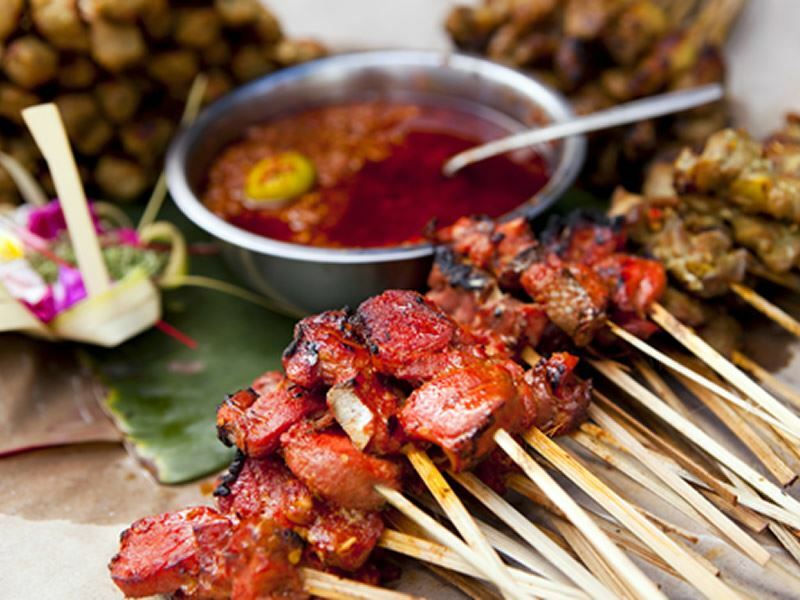 Balinese cuisine revolves around the ‘bumbu’, the Indonesian word for ‘seasoning’. To a more western palate, this is more like a spiced paste that forms the basis of the dish. This is generally a mélange of locally sourced spices, roots and vegetables smashed together with a pestle and mortar to elicit the most incredible aromas and tastes imaginable. The principle ingredients in these pastes are garlic, shallots and ginger, not dissimilar from those found in most eastern style cooking. The more novel ingredient is ‘galangal’: a root akin to ginger which possesses a less earthy and more potent citrus and spicy flavour. The bumbu is finally stir fried in coconut oil to release the intense flavours and fragrances before the meat (often steamed) is added. Wherever you’re staying on this stunning Island, you’ll find an abundance of street food stalls (‘Warungs’) in areas frequented by the locals. The food is steamed in a small portable steamer and the parcels of food are wrapped in a banana leaf, with the type of fold indicating the variety of meat to be savoured inside. There are also night markets to submerge yourself in. The aromas and flavours in these places are well worth the visit, even if you aren’t brave enough to eat from the market sellers stands! If restaurants are your preference though, you’ll have endless choice. Just beware; wine is incredibly expensive in Bali. It is difficult, in restaurants, to find a bottle of plonk for less than half a million rupiah (around £25). Imported wine is taxed quite heftily in Bali so drink local and stick to the beer or the Arak (a local liquor). Famous for being the tranquil and cultural setting for Julia Roberts to ‘find herself’ in ‘Eat, Pray, Love’. When visiting, try the famous ‘babi guling’ at Warung Ibu Oka. Taxi drivers will mention it which is always a good sign. This gem sits modestly opposite the old Palace and provides the most moist and tender suckling pig mingled with a super rich and tasty bumbu.They roast one suckling pig a day and close when it is all gone, so best not have a huge breakfast and turn up early to avoid missing out on the delights that await. Couple this with the custom of sitting on the floor to eat, a large glass of ice cold ‘Bintang’ (the local indonesian beer) and parting with the equivalent of about £2-3 pounds each, and this seems to be one of the best kept, not so secret, secrets of Ubud. Another great restaurant is ‘Three Monkeys’. The restaurant itself has a wonderful view of a paddy field and the ambiance and décor is very warm, welcoming and traditional. Staples on the menu are the ‘Nasi Goreng’ – fried rice, and Sate Lilit - Fish Satay. The fish is generally minced together with prawn and is wrapped around lemongrass before being barbecued. The result, a slightly different, slightly more robust texture with subtle citrus overtones and a mild barbecue taste. Seminyak is slightly more westernized and with it being a touch more ‘urban’ than Ubud, there are infinitely more places to eat. Warung Murah is one particularly unimposing venue that is well worth a visit. They offer a menu, as all good restaurants do, but tourists come to sample the buffet! A selection of Thai, Chinese and Balinese dishes are on offer and you are given a small ‘ticket’ with your visit to help with the maths when it comes to the bill. Some incredible foods are on offer and the buffet style means you can sample the lot. My friends favourite foodie experience was being privvy to the ‘tricks of the trade’ on a cookery course, one of the most popular ways to get to grips with foodie culture and technique in Bali. Article written by Levanah Gates.